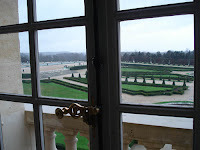 We visited the chateau at Versailles in the middle of a major windstorm, so plans to start in the gardens were scratched. Some of us looked longingly out the window ... [That would include this blog's author, Dr. Fowler, who had planned a lovely tour :)] Some of us did get into the gardens later. 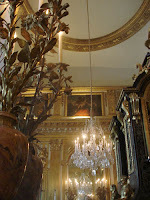 Of course Versailles is full of gold, glitter and excess as befits the architectural symbol of Louis XIV's power over his country and his courtiers. 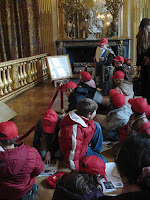 We wondered what the young French school children thought as they filled out their worksheets! Yes -- they had worksheets too! FINALLY some of us ventured out into the gardens. You really can't imagine the scale of their design until you walk through the various sections. 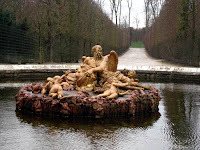 This is the Saturn fountain.